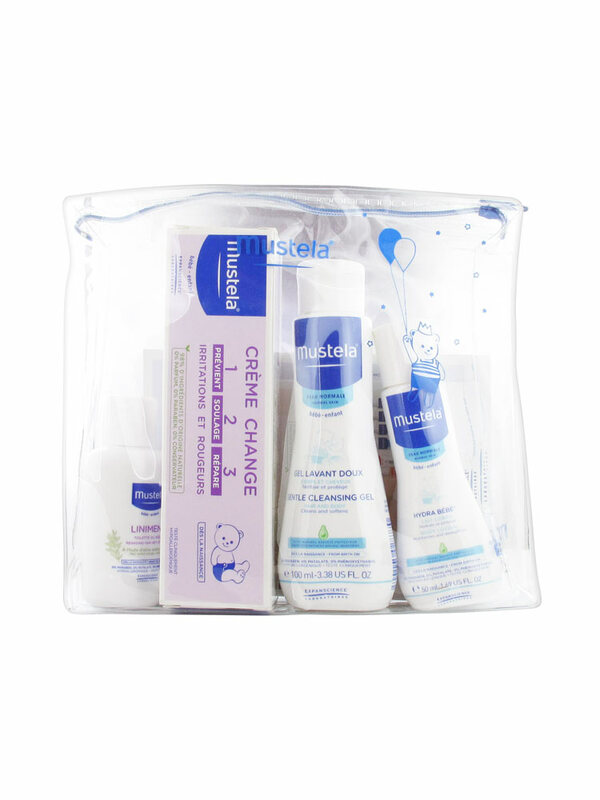 Mustela Birth Kit: this case containing all the necessary products to the first cares of your child from birth. - Mustela Dermo-Protective Liniment 50ml is a natural preparation with extra-virgin olive oil rich in oméga 6 and 9 and with calcium hydroxide, used for generations to cleanse, protect and soothe your baby from the birth. After application, its rich and fragrance free creamy texture forms a protective film on the skin to prevent attacks related to humidity and friction due to nappies. This gentle treatment is suitable for all skin types, even sensitive. Tested under dermatological and pediatric control. Hypoallergenic. - Mustela Change Cream 1 2 3 50ml is a cream that prevents, soothes and repairs irritation and redness of the seat in babies and infants. Fragrance-free, paraben-free and preservative-free, this clinically tested cream is formulated to minimize the risk of allergies. It can be used from birth and until baby stops wearing diapers. A complete skin care, it prevents through Perséose Avocado, relieves from the first application through Oxéoline of Alcacéa and lastingly repairs with the Sunflower Oil Distillate. In addition, the zinc oxide adds protective and anti-enzymatic properties. - Mustela Gentle Cleansing Gel 100ml efficiently and gently cleanses and protects the skin and scalp of babies from the birth. Its high tolerance formula (cutaneous and ocular) combines more than 90% of ingredients from natural origin such as the avocado perseose that strengthens the cutaneous barrier and preserves the skin cell richness. Formulated to minimise risks of allergic reactions. - Mustela Hydra Baby Body Milk 50ml moisturises and protects the normal baby body, from the birth. The formula of this body milk contains avocado perseose, a patented natural ingredient that strengthens the cutaneous barrier and preserves the skin cell richness. It immediately and durably moisturises the skin, preserving the water balance in the epidermis. 97% of the ingredients are from natural origin. Formulated to minimise risks of allergies. - Mustela Dermo-Protective Liniment 50ml: Before every change, apply with a cotton pad. No need to rinse. Shake before use. - Mustela Change Cream 1 2 3 50ml: Apply to the epidermis at each change. - Mustela Gentle Cleansing Gel 100ml: Pour in the hand, lather onto body skin and hair. Rinse. - Mustela Hydra Baby Body Milk 50ml: Apply morning and evening on the baby body. Indication: Care kit for baby.